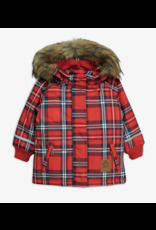 Padded winter jacket in red with a removable hood and faux fur. 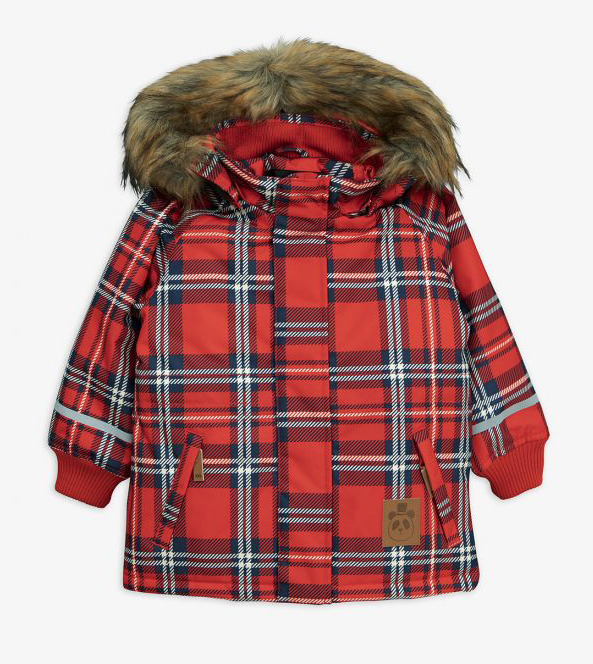 The jacket has an all-over checked print inspired by tartan and a faux leather patch with a panda imprint at bottom front matching the zip sliders. 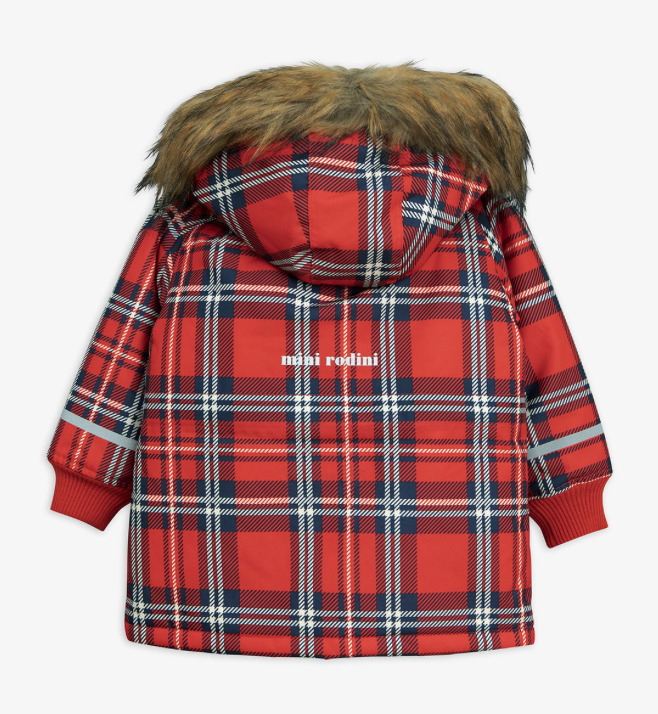 The jacket is highly breathable and water resistant with 5000 mm water columns, made of a functional and heavy-duty shell fabric with taped seams and BIONIC-FINISH® ECO coating. The soft rib cuffs at sleeve endings and inside the collar prevent wind and snow from getting in, and the smartly placed reflectors increase visibility when the days get darker. 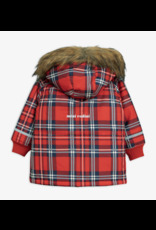 K2 is the most advanced winter jacket in Mini Rodini's line of products, part of Mini Rodini’s Explorer series which consists of especially functional and durable outerwear, produced to be warm, water-resistant, highly breathable and withstand almost any kind of weather. • Front zip with protection placket • Adjustable elastic string at waist for a better fit • Two zip pockets at front • Removable hood with two seams for a better fit • Raglan sleeves with reflective stripes • Printed reflective Mini Rodini logo at the back • Polyester satin lining in body and sleeves • Breathable with 5000 g/m2/24h • Water-resistant with 5000 mm water columns • Shell 100 % recycled polyester • Lining 100 % recycled polyester • Padding 100 % recycled polyester • BIONIC-FINISH® ECO • Made in China This jacket has a water-repellent BIONIC-FINISH® ECO coating. In most water-repellent coatings on the market today the use of fluorocarbons is a rule rather than an exception. These chemicals decompose very slowly in nature, are easily spread and nowadays found worldwide. They impair reproductive ability and are also suspected to cause cancer. BIONIC-FINISH® ECO is made with an alternative technique and is not only free from PFC and fluorocarbons but also from formaldehyde and paraffin. The recycled materials used to make this overall are GRS certified which ensures that the fabric consists of recycled materials made from, for example, PET soda bottles, discarded fishnets and used clothes. GRS is the strictest certification for recycled materials on the market today and includes rigid controls of especially chemical use and tracking, but also working conditions.